Here is a handy list of French herbs and their principal uses in French cooking. In almost all cases, fresh herbs will give dramatically better results than their dried counterparts. However, some freeze dried herbs may give quite satisfactory flavor as well. It's always nice to keep a few fresh herbs on hand in the kitchen. Just pick your favorites or what is available. You really need not limit yourself to how they are used in recipes. Just tune into the taste and explore. Bay Leaf - Laurier - These dried leaves have a pronounced, sharp taste. They are used in stews, poaching liquids, and marinades. Normally one bay leaf is enough to flavor a whole dish and it is removed before serving. Dill - Aneth - Dill seed is used in marinades or to flavor vinegars. Fresh dill is used with fish (notably salmon), cucumbers, omelets, salads, pasta and in this dill sauce recipe . Dried dill is of little culinary interest. Bouquet Garni - A bouquet garni is a bundle of French herbs that are tied together with kitchen twine and added to stews and other long simmering dishes. What goes into a bouquet garni can vary, but the classic is thyme, bay leaf, and parsley. Chervil - Cerfeuil - This is a very common herb in French cooking. It has a subtle anise taste and should always be used fresh and never over heated. Add at the last minute for best results - soups, omelets, or on top of a salad. 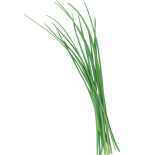 Chives - Ciboulette - Chives have a mild onion taste. Sold fresh or freeze dried, chives can be used in salad dressings and vinaigrettes, with eggs, and also as a garnish. To preserve their flavor, always chop chives just before you use them. Fines herbes - This term designates a mix of finely chopped fresh French herbs, including parsley, chervil, tarragon and chives. Typically they are added to recipes at the last minute. Fines herbes can be used to make compound butters and to flavor an omelet. Herbes de Provence - A mixture of aromatic dried French herbs including thyme, rosemary, bay leaf, and savory. Used to flavor grilled foods and stews. There are some goat cheeses that are covered with herbes de Provence as well. Marjoram - Marjolaine - This is similar to oregano but not so strong. It can be used fresh, dried or freeze dried and appears in the Mediterranean cooking of France. Mint - Menthe - Several different varieties of mint are used in cooking, but the most common is sweet mint, or spearmint. Add it to this cucumber salad recipe , with peas, rice, soups, sauces and also with grilled meats. 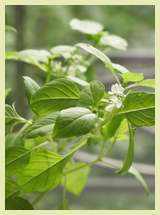 Peppermint is used to make liqueurs and to flavor some desserts. Dried mint preserves its flavor for a long time and is a good alternative if fresh is unavailable. Oregano - Origan - This herb has an assertive, piney taste. It is best used fresh, although it is also available dried or frozen. It makes a good addition to tomato based dishes and other Mediterranean inspired recipes. Parsley - Persil - Fresh parsley is available virtually year round in many part of the world. Typically there are two types: curly and flat leaf. Flat leaf parsley is stronger tasting and holds up better to a little cooking. You can add parsley to just about anything and of course use it as a garnish. It is combined with garlic to make persillade . Romarin - Rosemary - Rosemary leaves are needle shaped and have a strong lemon or pine smell Fresh or dried, rosemary should be used with moderation. It is typically used with grilled meats, stews, and marinades. Savory - Sarriette - This herb might be used fresh or dried. Used most often in cooking beans, but also in stews and marinades. It is interesting to note that this herb was was used extensively by the Romans to flavor their food. Sage - Sauge - Another herb that can be used either fresh or dried, sage has a very strong odor. Its flavor goes well with veal. It is also used to make stuffing for turkey or goose. 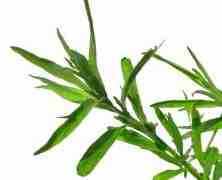 Tarragon - Estragon - Tarragon has a strong, somewhat licorice-like taste. It might be fresh, frozen, or dried. Fresh tarragon is more subtle than the dry version. It holds up well to cooking and is classically paired with chicken and eggs. Might be used in compound butter and to make tarragon vinegar . Thyme - Thym - This is one French herb that is equally good fresh or dried. In French cooking it will often compliment tomatos, and is used in making beans, stews and cassoulet . It is also drank as a tea - said to be good for many ailments. Go from French herbs to French Foods.